Microsoft appears to be working on a new version of Windows Server aimed at web-scale operations. News of the product comes via Neowin, which noticed a deck of slides titled “Nano Server: The Future of Windows Starts Now” posted to a Russian blog. We can't say with any certainty if the slides below are genuine, Issa looks like he'd be in a position to put his name to such a deck. So with a pinch of salt in hand, let's proceed. Nano server looks to be a response to customer worries that disruptive patching is painful, rebooting operating systems takes too long and Windows Server needs a lot of resources. Microsoft customers are also wary of the large attack surface offered by a “full” operating system and would rather something smaller, safer and capable of being deployed as smaller and therefore denser virtual machine flocks. The deck notes that Microsoft has sorted some of this stuff out: Azure does Windows at scale and the Cloud Platform System does density well, although both still require disruptive updates. 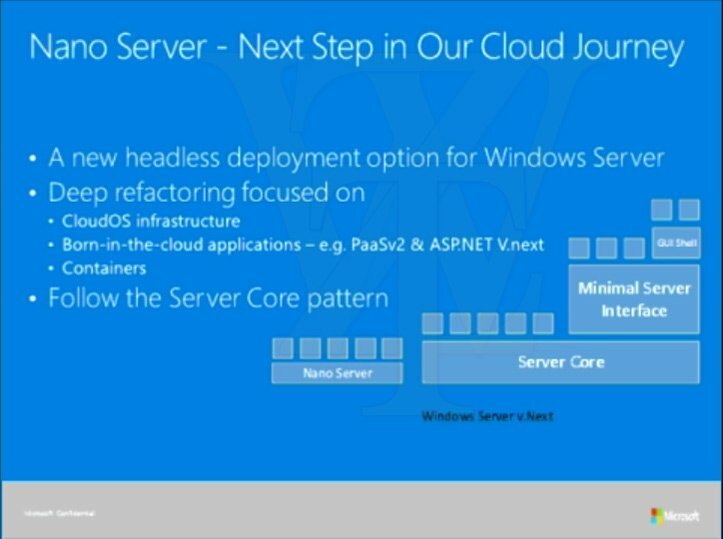 Nano server is described as “The next step in our Cloud journey” and appears to be designed with cloud-native apps in mind. It's suggested the product be headless, but offer either web-or-PowerShell-driven management tools. 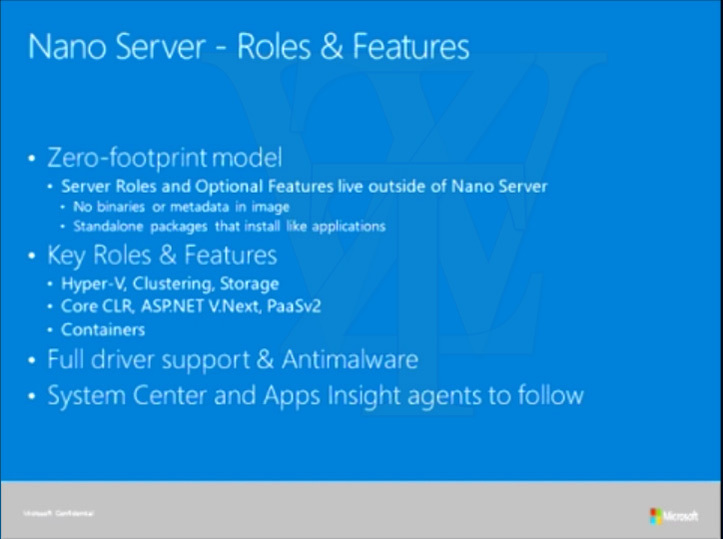 Intriguingly, Nano Server is described as “the future nucleus of Windows Server” and “Will be part of the next release of Windows Server”. Users have a while to wait before they can get their hands on it: the deck says it won't be in the next version of Windows Server preview but “will be in the next release after that”. Which is where it gets even harder to predict the arrival date of the product, becuause the deck suggests Nano Server will reach “Limited TAP” - presumably Microsoft jargon for “selected members of our Technology Adopters Program” - “in early 2015”. Windows Server “Next” isn't due until 2016. If this deck is accurate, it's now possible to understand why as the work required to turn Windows Server into a lightweight core server with optional modules won't be trivial. Microsoft's been a little down this road before, with Windows Server 2008 introducing a “headless” version (under the in-house joke of “The Wow Stops Now”, a reference to the slogan used to launch Windows Vista). Nano Server looks to be a more radical rethink of Windows Server to make it relevant to current trends around containerisation, virtual machine density, and commodity servers being pressed into service as switches or storage arrays. It makes sense for Microsoft to go there and a if that's Redmond's destination it also explains why the company is willing to spend an extra year on the upgrade: this is a big change, not just a product refresh. A more lightweight Windows Server would also make it easier for Microsoft to deliver rolling upgrades in SaaS style. It might also help to ease the complex interrelationships between Windows Server components that occasionally creates patching problems.